I’m always looking for new and innovative ways to raise money for the charity (Dachshund Outreach Giving and Socialization) while showcasing some original dachshund photography. 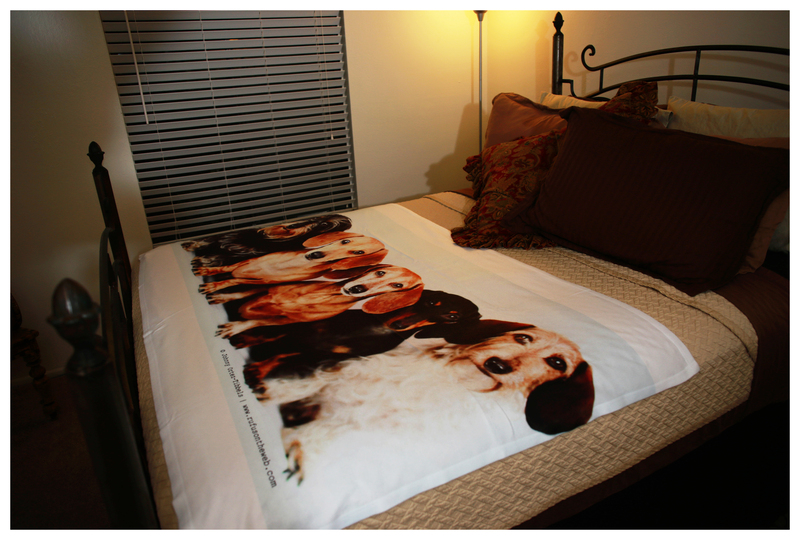 Well, I found these lightweight blankets (40″ x 60″ inches). They are a super soft poly-fiber jersey fleece material that is machine washable in cold, and can be put in the dryer (supposedly but I don’t necessarily recommend it). The edges are turned and sewn. I have never worked with this fulfillment house previously so I don’t have any experience with their products, but I really like how the blankets turned out. The charity’s cost to produce and ship the blankets is $50. Only three blankets were made, and at this time I have no immediate plans of making others. I like producing specialty items in limited quantities to make them distinct, hard to find, unique collectors’ items. AND… if some day I end up being a world-renowned dachshund photographer and artist, perhaps they’ll be worth something (to someone). One can dream, right?! If you want a one-of-kind blanket, it can be yours for a tax-deductible donation of $85 (or more). 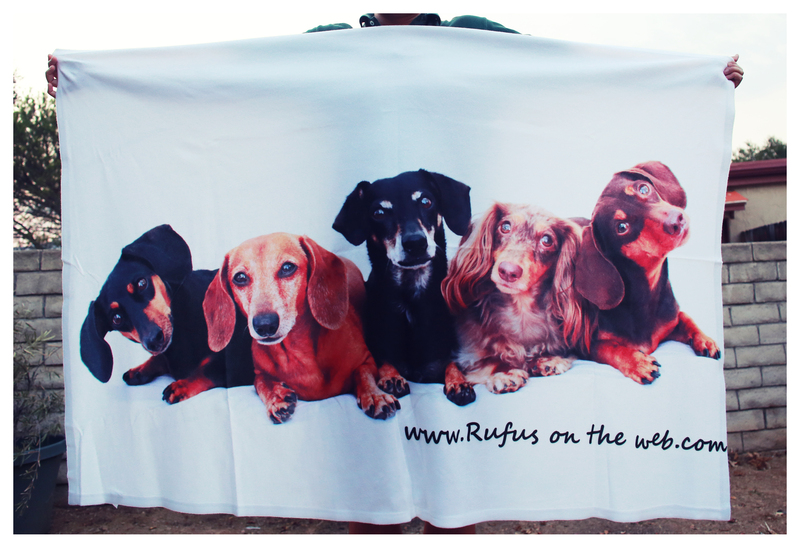 I was very tempted to keep the blankets for myself but I feel like it’s more important to raise operational funds for the charity than satisfy my personal vanity to decorate my home in all things dachshund (though it was not an easy decision, I think it’s the right one). The blankets could be used as throw blankets when watching TV or reading a book, or they could be nice accent pieces for a bedroom set. They could even be framed and hung on the wall, if inclined. The blankets will be given out on a first-serve, first-come basis. The first three people who make their donations will get them. Please specify which blanket you want in order from 1 to 3, I’ll do my best to honor your request. If you make a donation AFTER all three have been given away, a full refund will immediately be issued. Thanks in advance for the consideration. Even if the blankets are not your personal style or in your price range, let me know what you think in case I decide to produce some in a greater quantity going forward. UPDATE: Wow, as of 7:30 PST 9/12/13 all blankets have been allocated. Thank you! This entry was posted in DOGS and tagged #dachshund, doxies. Bookmark the permalink. I would like to buy blanket #1, if it is still for sale. Thank Bonnie for the consideration. As of 7:30 PST 9/12/13 all blankets have been allocated. Thank you! Great concept, love the look!! 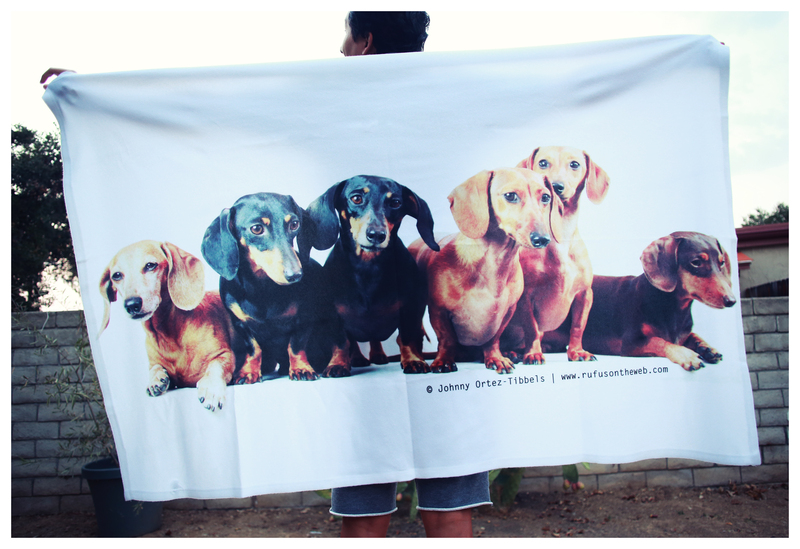 Can you do one offs, say a custom blanket with one dog on it? Say perhaps…. my dog? (you can see where my mind is going with this….today a blanket, tomorrow a billboard!!) 😉 Nicely done!!! Now you’ve done it. !! We ALL want one. I have 4 mini’s and need one for my new bed in my new home. So I think it’s a great idea to have MORE done. I think you’ll make a fortune for the group. Thanks ! I’ll be following and waiting for MY chance to order. Anything for my fellow thank you. 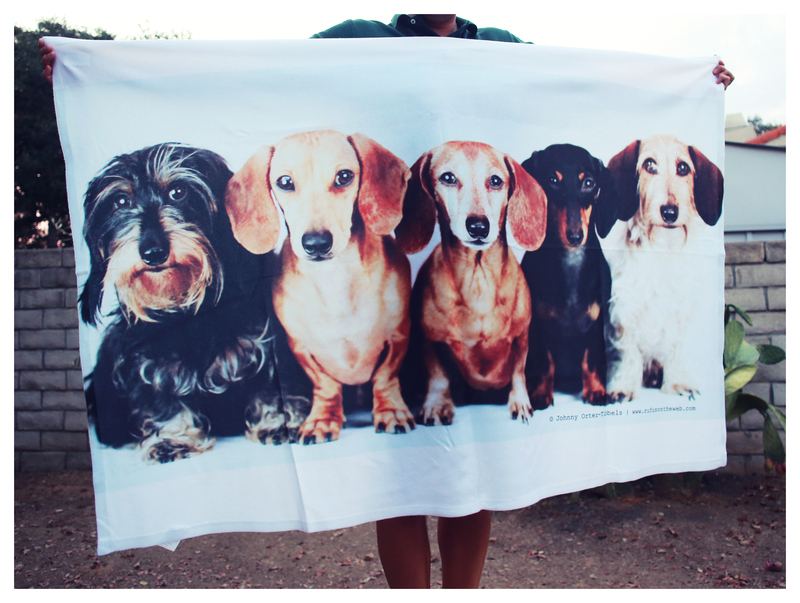 dachshund lovers…! These blankets were sold during a special promotion – which now has ended. However, if you still want one we’ll happily do it for a tax-deductible donation of a $100. To make your tax-deductible donation please click here –> http://tiny.cc/gcxq3w ; Once the donation is received we’ll discuss the image you want via email or private message on Facebook. The blankets usually arrive within 2 weeks. Hope to hear from you. Thanks for the consideration. Your positive feedback and interest is humbling. I received my blanket and absolutely love it! It is so soft and the picture is adorable. 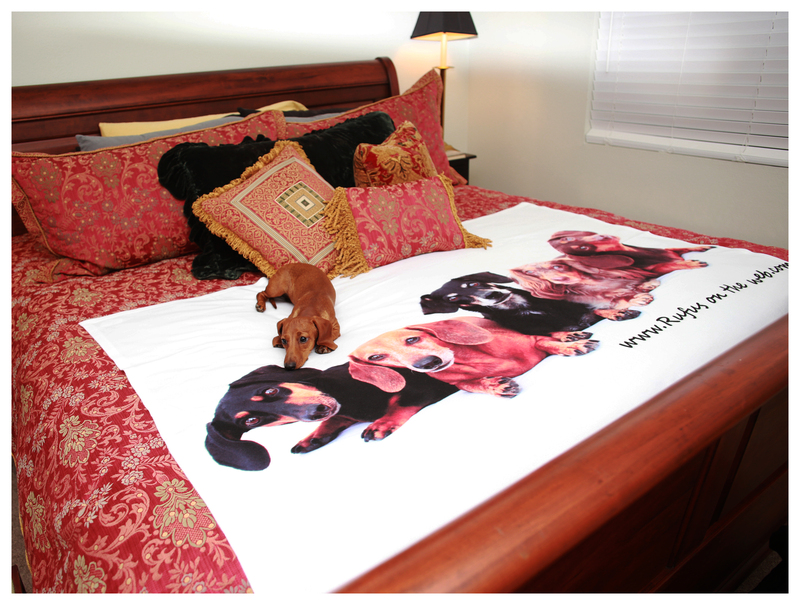 Perfect for me and my doxies to cuddle in on a cool fall day. My only concern is that it is mainly white and shows dog hair pretty easily especially since I have black and tans. Wonder if they could make it in a different background cover. Keep up the great work, Johnny! These blankets were sold during a special promotion – which now has ended. However, if you still want one we’ll happily do it for a tax-deductible donation of a $100. To make your tax-deductible donation please click here –> http://tiny.cc/gcxq3w ; Once the donation is received we’ll discuss the image you want. The blankets usually arrive within 2 weeks. Hope to hear from you.